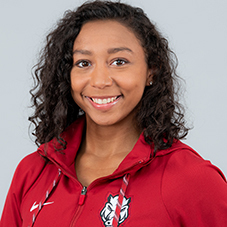 Competed on beam and floor exercise for Arkansas in every meet this season … Tied the previous beam record 9.950 on balance beam and score a 9.875 on the floor, both personal-bests against Georgia on Jan. 26 … Went on to score a 9.875 on floor two other times in the season against Auburn on Feb. 9 and at Florida on Feb. 23 … At the SEC Championships scored a 9.800 on both balance beam and floor on March 24 … Scored a 9.900 on balance beam and a 9.800 on floor at the NCAA Regionals to help Arkansas advance to the NCAA Championships … Recorded a 9.850 on the beam and a 9.8625 on the floor at the NCAA Championships … Has competed in 24-straight meets on the beam … Posted six scores of 9.900 or higher on the beam. Made her collegiate debut against UCLA on Jan. 7, competing on uneven bars and balance beam… Scored a personal-best 9.825 on balance beam against Missouri on Jan. 13 and a personal-best 9.700 on uneven bars against Georgia on Jan. 20… Tied for the team lead on uneven bars (9.825) and balance beam (9.850) against Alabama on Jan. 27… Scored career bests on uneven bars (9.850) and balance beam (9.875), tying for the team lead on uneven bars at Auburn on Feb. 3… Won her first career individual event title with a 9.825 on balance beam against Centenary and San Jose State on March 10… Scored a 9.800 on both uneven bars and balance beam at the SEC Championship on March 18. Competed for Legacy Elite Gymnastics, same as Amanda Wellick … Competed at Level 10 since the beginning of 2012 … At the 2015 Illinois State Championships, was floor exercise (9.65) champion and balance beam (9.45) runner-up … Qualified for 2015 J.O. National Invitation Tournament … At the 2014 Illinois State Championships, won vault (9.775), beam (9.5) and all-around (38.2) titles … Won uneven bars (9.525) title at the 2014 Region V Championships … Placed fourth in all-around (38.4) at the 2014 J.O. National Championships. Graduated from South High School in Downers Grove, Ill.
Born on Jan. 15, 1998 … Daughter of Mike and Kelly Burton … Has one sister, Claire, who is a senior and plays basketball at South High School … Majoring in journalism.